Heat oven to 375°F. In 12-inch skillet, cook beef and onion over medium heat 8 to 10 minutes, stirring occasionally, until thoroughly cooked; drain. Set 12 peas (from frozen vegetables) aside for garnish. Add remaining frozen vegetables, tomatoes and gravy to beef mixture. Heat to boiling. Reduce heat to medium-low. Cover and cook 8 to 10 minutes, stirring occasionally, until vegetables are crisp-tender. Meanwhile, in 2-quart saucepan, heat water, butter and garlic powder to boiling. Remove from heat; add milk. Stir in dry potatoes; blend well. Spoon beef mixture into ungreased 8-inch square (2-quart) or oval (2 1/2-quart) glass baking dish. 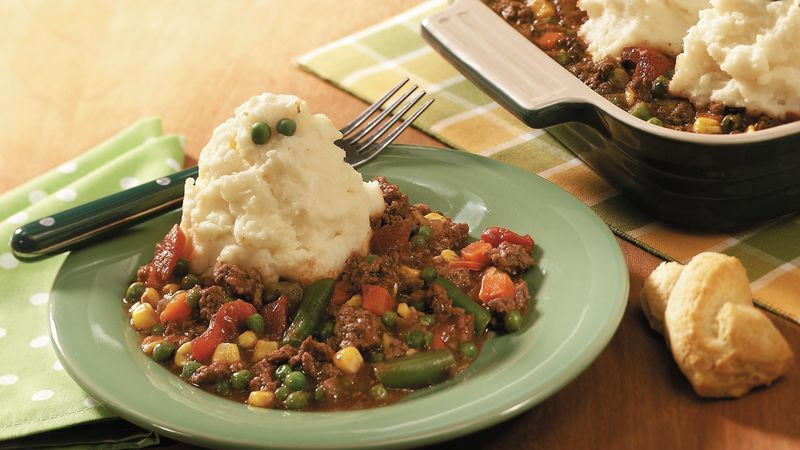 With large spoon, make 6 mounds of potato mixture on top of beef mixture to look like ghosts. Place 2 reserved peas on each mound to look like eyes. Bake 20 to 25 minutes or until potatoes are set and mixture is hot. The early Celts believed you could drive away the ghosts that came out on Halloween by lighting lanterns or candles. Why not keep these little ghosts at bay by lighting candles at the dinner table? Serve bowls of delicious, saucy "pie" with cut-up veggies and dip and warm-from-the-oven breadsticks.